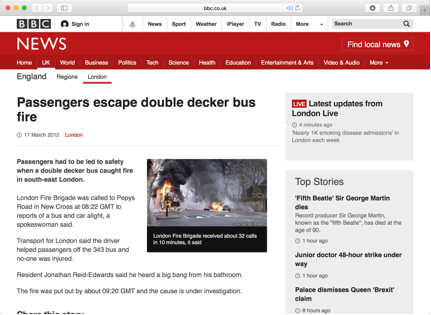 In 2012, the number 343 bus caught fire outside my bedroom window in southeast London. Caught fire might be misleading. Rather, it exploded, rattling my windows, waking me up, and drawing most of the neighbours – or at least those who did not have to go off to work at 8 AM – out into the street to look. I knew the 343 bus well – it was my route to the supermarket, to my girlfriend’s house, to the cinema, the pub, the park. I, along with my fellow neighbours, rode it almost every day. It was, I thought, ‘my’ bus. 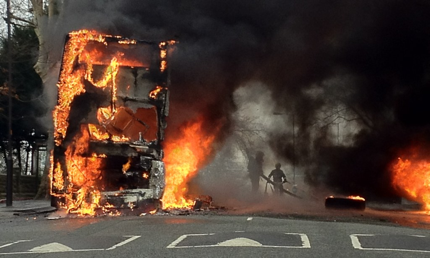 So it was strange to walk outside in my pyjamas and slippers that early March morning and join the gaping sodality as the big red bus burned before our eyes. No one was injured – that much we could tell. The ambulance was off to the side, the paramedics idle. Nor were the fire brigade in any big hurry to do much about it. ‘Best to let it burn itself out,’ one of them told me as his colleagues languidly sprayed the flames. Slowly, the big red vehicle disintegrated in front of my eyes. I’m not sure what was more bizarre: the burning bus itself of the pictures of the burning bus – my burning bus – on news sites, in the paper, on TV. The police were not treating the incident as suspicious, which struck me as odd. Not that I suspected terrorism – not at all. But still, a burning bus, or rather an exploding bus, struck me as incredibly suspicious. A robbery of sorts. That was our local bus, I felt like shouting. And now it’s gone, without so much as a police investigation. I’ve since moved out of that house, but I still live in the same area, and I still ride the 343 every now and then. Recently, after visiting a friend near London Bridge I decided to ride it home – something that I hadn’t done in some time. It was a rainy afternoon. Blustery. The bus was nearly full. The windows had fogged up. It would be a long journey, but I didn’t mind. The 343 is one of those circuitous buses. It traverses few main thoroughfares, choosing to snake down the suburban roads, the backstreets, all the way from City Hall to New Cross Gate. This can be explained by the fact that the 343 wasn’t always the 343. Before the route was sold to Abellio – a Dutch transport company, one of the handful of private corporations in charge of London’s various bus routes – it was known as the P3, one of those single-deckers meant to shuttle pensioners and schoolchildren from door, to shop, to door. When Abellio bought the line, they expanded the service. Now it’s one of the least efficient bus routes in all of London,among the ten worst performing in the whole city. The bus halted in traffic at Elephant and Castle. I rubbed the fog off the front window to see the large construction site just beyond the old shopping center. This used to be home to the Heygate Estate, which was demolished last year. A few cranes swayed in the wind. A man sipped a cappuccino outside one of the refurbished shipping containers at the new Boxpark. 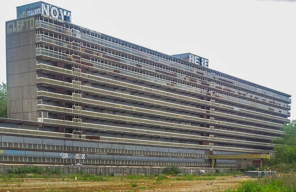 I had no right to get romantic about the Heygate – it was a hellish, rusk-hulk of a ruin. But this too felt bleak. 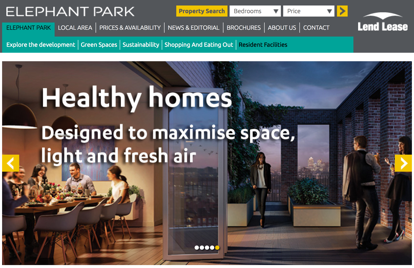 Just beside the Boxpark was a large digital picture of the world to come: the new development was to be called Elephant Park, and flats were officially for sale. Old London burnt up, purified by fire, making way for the boxy corporate design of condos and flats, soon to be home to white-collar workers, low-level execs, those trying to get a rung on the property ladder. A bastion of healthy living: a gym, rooftop gardens, a children’s play area – residents’ access only. Eventually the Walworth Road unjammed, and the bus turned on to one of the small roads heading south. Ads for Elephant Park continued for another half-mile or so: large, digital illustrations of the bright, white redevelopment scheme. But the advertisements disappeared as soon as we reached the Aylesbury Estate, where a good portion of passengers alighted. I was always fascinated by the Aylesbury when I passed it on this bus: I knew it as one of the most ‘notorious’ estates, not to mention the largest social housing project in Europe, a great grey city unto itself, where Tony Blair made his first speech as Prime Minister, promising to bring prosperity to Britain’s ‘forgotten people’. But I recognized it from somewhere else, too. Television. 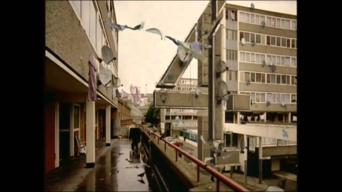 That old Channel 4 ident, in which a camera pans slowly out onto one of the balconies, surveying the bleak ruin as a large number 4 arranges itself in the center of the screen. The estate doesn’t really look like this, of course. The Channel 4 film crew brought along a few props when they filmed this little clip: plastic bags, wet washing lines and empty lager cans were placed in the shot for effect. The satellite dishes dotting the windows were added later, in post-production. The bus carried on past Burgess Park, through the strange residential area between the Walworth Road and the Old Kent Road. We passed rows of old Victorian terraces, a few smaller estates and a handful of new Elephant Park-style condominiums. But as we rode, I noticed something strange. Something was missing from my journey. The announcements – that was it: the bland, computerized female voice that announced each stop had ceased. The journey felt somehow empty without her.